Peter Mountford’s enthralling new novel, The Dismal Science, looks at what happens when a recently widowed World Bank administrator gets embroiled in Latin American politics. In this companion to Mountford’s debut, A Young Man’s Guide to Late Capitalism, middle-aged and recently widowed World Bank administrator Vincenzo D’Orsi comes undone, jettisoning nearly every one of his personal and professional relationships. Peter and I met at Elliott Bay Books in Seattle for a talk about identity, middle-age, and the 1 percent. I’ve been immersed in a work about the loss of my husband’s memory, and I think your work has a great deal to say about the connection between identity and memory. When I was 11, my mother died of lung cancer, and since then a number of people who were close to me have died—I guess I have a grim track record in this way. One of the difficult things about losing someone, I’ve found, is that your memories of them become unreliable. I’ve heard it said that memory is a dream machine, which seems true, so all memories are increasingly fallible. After someone you’re close to dies, your perception of who they were becomes increasingly suspect—the perceptions bend toward a notion that you want to have, or that conforms to a narrative you cling to for some reason. I think it’s one of the most cruel of the subordinate losses that accompany death. Your character Vincenzo sets out on a course of action that has far-ranging implications. Do you think we can see the consequences of our actions before we take them? No. And that’s one of the difficult things about being human—we must make all of these decisions: who to marry, whether to have children, how many children to have, what city do you want to live in? But you’re in a state of almost total darkness about the consequences of these choices. Sure, you can make educated decisions, you can assure yourself that you know what it’ll be like to have a kid or whatever, you can do your due diligence, but finally the results are surprising. And there can be alarming surprises. The baby you had has some grave genetic illness, or is a genius, or a psychopath. Change is a constant in life, and so people are always trying to forecast their way through it but are always flying completely blind. Did you have compassion for Vincenzo in that sense? I did. And I think in a way he’s trying to make moral decisions, and in a way he knows it’s a futile project. Ultimately, he wants to be a good person, but he also wants to find a way to be alive that has relevance. He’s in his mid-fifties, and he’s becoming afraid of the future and can see a predictability to his life, and he can also see the end of his life looming. Looking ahead, he detects very little risk-taking behavior—very few opportunities for daily delight and richly-lived experiences. He’s lonely. He has few connections. There’s a clear ceiling of what he can accomplish in his career. And he set up his life with his wife and then she died, a few years before the book starts, so there’s this barren landscape ahead—the phantom life. The only way forward is to wreak havoc upon the architecture of his existence. The things that support the life that he has come to know—he has to destabilize them, or as many of them as possible, in order to start fresh. You write about an older man here. Do you have an inspiration for Vincenzo? My father was an inspiration, for sure. My dad worked at the IMF for eons, and he read Dante very avidly, like Vincenzo. My father was also a widower and a chess player, and so I lent those characteristics to Vincenzo. That helped me get into his mind, but also much of it was me, too: his sense of alienation and attraction to chaos, those were mine. I didn’t see it for myself, just as he doesn’t see it coming for himself, but I was on the precipice of a major life change. When I started writing the book I was married with kids, living in a nice house. Now I’m divorced. I’m not going to get specific about it, but the book is oddly, subtly, autobiographical. David Shields called The Dismal Science “an elegant work.” The book employs a style that feels like it’s the antithesis of who Vincenzo is as a character in some way. There’s an astringent quality to the prose that doesn’t really feel like me writing. I think it’s sort of Vincenzo, but much more controlled, of course. Reading it over, the strange thing is that I feel like an actor looking at himself inhabiting a role he can’t fully access anymore. The voice of the narrator of this book is quite different from my voice in my first book, and it’s very different from the voices of my personal essays or my other fiction. And I think it was simply because of the influence of Vincenzo. He’s a serious economist and he’s a reader of classical literature and so I wanted the voice to somewhat reflect who he is. I was struck by these amazing objects that occur throughout: the caviar, the Barolo, the Mercedes, the attic stuffed with things, the gym memberships that aren’t used. Signifiers of wealth. What were the specific events in your life that made you write about the implosion of a man… And does it speak to your access to the rich? What do you want to say about the 1 percent? (Laughs) I’ve never made that much money. I don’t want to say I’ve been poor, but I’ve certainly never been able to buy a new car, for example. That said, I’ve spent a lot of time around really, really rich people, and so I’ve seen their relationship to their possessions up close. I’ve often found it very moving in a strange way, the manner in which their passions are either smothered, or shielded by, or sometimes transmitted through, the purchasing and maintenance of a these magnificent objects. If you have a couple of houses it’s this project— it’s preposterous, yes, but it’s also real. And the very rich are often intensely isolated, they’re social juggernauts, but they’re also so withdrawn. Look at Michael Jackson, at Howard Hughes, at J.D. Salinger—they’re lurching toward the light and they’re also hiding from it. It’s not celebrity doing that to them, I swear—it’s money. Vincenzo goes on this strange shopping spree in an attempt—a sad, sad attempt—to erase the memories of something he feels. The kitchen supplies are all imbued with the memories of his dead wife. They’re all totems that will bring her back into his space. So he runs out, and he has the financial wherewithal to do this. He acquires this arsenal of kitchen supplies, and it’s a weirdly labor-intensive excursion. But it doesn’t really help. You have a character here who can undo an economy, but he literally can’t mend a fence. The book is full of philosophy — Milan Kundera, Machiavelli. Are economists trying to lean into the black and white, what your characters call “bracingly clear” parts of life, or into the philosophical aspects of economics? Because of the mathematics of economics, the simplicities of it, it’s very hard to allow multiple variables to be in flux simultaneously. There are things that are immeasurable, too, about the human experience, so economists are trying to understand human behavior, which is this very irrational and crazed thing, except when it’s not. They’re trying to fix it in this binary, black-and-white way. There’s recently been a move toward behavioral economics, the study of the way people actually behave, as opposed to the way people should behave. What is it about the geometric aspects of your book? There are these amazing snowflakes that show up, the architecture of the bank, Kundera’s circles. Vincenzo’s father’s name is Geomar. Vincenzo is wrestling with a hunger for clear understanding, for answers. He wants to be able to forecast—of course everyone wants to be able to forecast a future for themselves as individuals—and in his case, he’s also trying to forecast the economies that he works with. And yet also he realizes it’s such a futile project, so there’s a tension with the muck of reality, the chaos of daily existence. He wants to see clean lines in the world, but he knows it’s a false reassurance. There isn’t actually a clean line, or a perfectly geometric snowflake. It’s a false god. It’s not actually promising any clarity; it’s saying, ‘Here is more chaos.’ It’s just a different chaos. D’Orsi comes close to the Italian name for spine. Does Vincenzo have one? He definitely has a spine—what he does is crazy. There is a strategy, it’s a topsy-turvy strategy, and there’s a bravery to it: very few people would climb that high within a career and then just start blowing it up. He ends up being risk-embracing in a way that I admire. He’s not actually reckless, doesn’t do anything that’s truly stupid. Things are going to end up okay for him in the long run, but it involves a lot of loss. He’s going to lose a lot with this decision, and I think he’s maybe even prepared for that. It felt to me like a beautiful mid-life event. Mid-life crises are often denigrated. They’re seen as laughable—the fading beast aims to reclaim his youth. We think of the man with the hairpiece and the Corvette with his twenty-year-old gym trainer girlfriend. There are these clichés around it, and yet it’s a powerful emotional experience to go through, a recognition of the brevity of life. It’s one thing to say “I know I’m going to die” when you’re twenty years old, but when you’re fifty and saying, “So, I can start to see the end of this life and what am I going to do about it? Am I just fine coasting like this, or am I going to start breaking things?” I think it’s perfectly understandable and, in fact, maybe even weirdly admirable that people might start wreaking havoc on their lives. They act in a selfish way, yes, but there’s an honesty to that as well, a desperate grasping at existence. You talk about the allure of fundamentalism and the power of belonging. What is that for you? I’ve wondered about that. I went to this undergraduate program, which was adamantly liberal. I grew up in DC where, whenever you have a very strong political ideal, you’re viewed with suspicion. People think you haven’t done your homework. Because if it looks that easy, if the solution is that clear to you, you probably don’t really understand the problem. The problems are so complicated. But the allure of fundamentalism—religious, ideological, or political—is that it offers a community. We are all holding hands and singing songs together, whether we’re in a church or in the Occupy movement. It’s about being less alone. It’s about finding a solution to loneliness rather than finding a practical solution to, say, the problem of wage exploitation for migrant workers. If you really want to address that problem, then you’d do your homework, you’d study calculus, and you’d spend time in the fields with those people, and you’d get to know the industry in an intimate way. It’s not nearly as much fun. There were these protesters recently in Oregon trying to stop this clearcutting, and all of these ecologists were saying that actually the clearcutting in question is extremely good for the environment because it mimics the behavior that natural forest fires would have in this region. If there’s no cutting then the plants and animals close to the floor of the forest will become extinct. You need meadows. It’s for the best. But these protestors refuse to get out of the trees, they’re all still up there. And I feel so much sympathy for them. They desperately want to be up in trees with each other—it’s the most magical thing that has ever happened to them, and they’re in love with each other, with this experience. It’s like that guy, the Grizzly Man. You want this thing for emotional reasons, and you haven’t quite done your homework. If you’d done your homework, you wouldn’t think that the grizzlies are your friends. You wouldn’t be up in that tree. Vincenzo sees all these protests outside, and he envies their community, the love that they share, but he dismisses their politics. Then he meets this young man from the Rainforest Coalition who is incredibly eloquent and who is able to present an argument for the masses outside. And it disrupts the paradigm for Vincenzo in a small but crucial way, because he sees that there are more possibilities, that just because you’re in a tree doesn’t mean you’re an idiot. Yes. Oddly enough, he ends up staying in touch with the young protester. Though he finds the kid absurd in a way, he also has a lot of respect for him. And he wants to be less alone, less elevated. He’s literally above the people, physically and also emotionally. He’s on the 12th story of this building looking out his window, and he can’t even hear them down there. He feels deeply alienated from these people, from his daughter, so he wants go down and hold hands with everyone. But how do you do that? He’s trying to figure that out, you know? How can I be less alone without becoming a cheerleader for some cause, without pretending to be a fundamentalist? 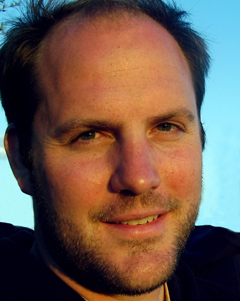 Peter Mountford won the 2012 Washington State Book Award and was a finalist in the 2012 VCU Cabell First Novelist Prize. He was awarded a 4Culture Grant, a grant from the city of Seattle, and the Corporation of Yaddo’s Wallace Fellowship for a Distinguished Writer. 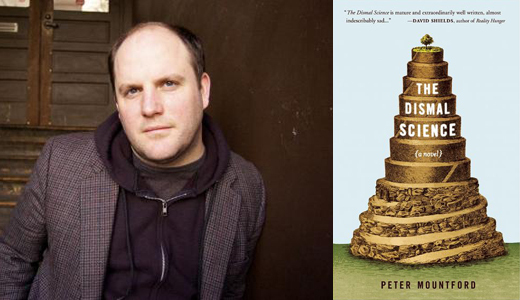 Since graduating from the University of Washington’s MFA program in 2006, Peter’s short fiction and essays have appeared in The Atlantic, Best New American Voices 2008, Conjunctions, Salon, Granta, ZYZZYVA, and Boston Review, where he won second place in the 2007 contest judged by George Saunders. He’s currently a writer-in-residence at the Richard Hugo House and at Seattle Arts and Lectures. The Dismal Science is now available from Tin House Books.